New Zealand-born Jono Kitto says Leicester Tigers were the only Northern Hemisphere side he wanted to play for after learning about them by playing against them in a computer game. 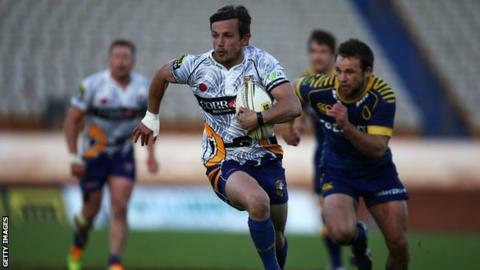 The scrum-half signed for Leicester in June having been part of Super Rugby's Chiefs' development team. "On 'Rugby 08' Leicester Tigers were the top team against the Crusaders," Kitto, 23, told BBC Radio Leicester. "I was a Crusaders fan so I thought the Tigers were at the same level as them." He continued: "If I ever found myself in the Northern Hemisphere, that was the team I wanted to support or play for. "In New Zealand, Manchester United is the only soccer team you hear about and Tigers are the same for rugby." Having grown up in Christchurch and played his early rugby in the Canterbury set-up, Kitto was helped during his early development by fellow countryman and former Leicester player Scott Hamilton. Kitto studied tapes of England scrum-half Ben Youngs, a player he will now compete against for a starting place in the Tigers' XV. "It's exciting to be able to play with him," Kitto said. "The study of Ben was done with Scott about what makes him a really good player. "I am here to compete, do the best I can and become a better player. I want to play as many games as I can and be a part of the squad, as well as make the most of the opportunities to learn."